General FAQ of LoA special edition was made to answer player's questions from our research post of 'Useful Guide in Need.' We have decided that some of player's ideas were indeed great and some guides will be made for them! 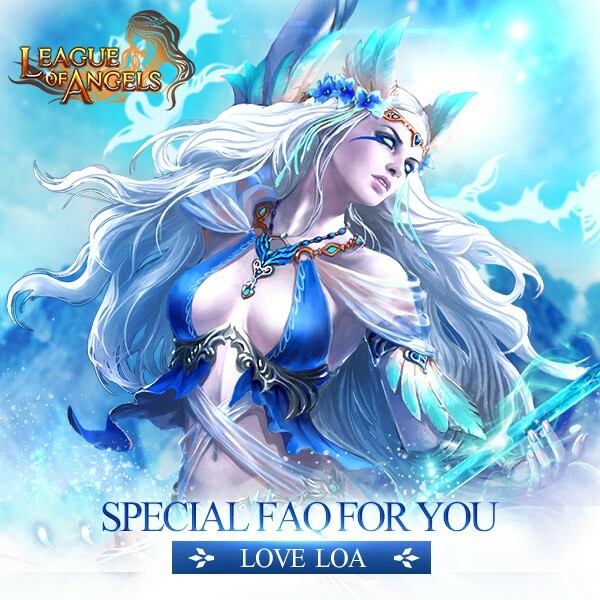 As for the others your ideas were great, but we don´t think there has to be guide for each one of them so we will answer you in this General FAQ of LoA 'special edition'. 1.) What to do with my extra wings shards and costume shards? - We prepare from time to time event called "Smelting" where you can smelt your extra shards and gain special points from them. Then you can use those special points and redeem prize from the list for free! 2.) When I inherit a hero what happens to the Blessed Stones used in his skills? - Be it blessed stones or soulstones, all will carry from source hero to the target heros stats. 3.) What Angels are best for Rage Buffer Heroes like MOD, Nereida and Astral hunter? 4.) Where do I find and gain Purifying soul? 5.) You guys have an awesome List of how much Ability have each angel at 10 stars max level , would be nice if you update it with how much Ability have them after each awaken. - This should be updated within week. :) We are missing 1-2 things which are the main reason this isn´t updated yet. 6.) Is there any list of angels and their compatible artifacts? And how they are worked to each other? - There is not such list as it doesn´t matter which artifact is on what angel, it is pretty random dependable of the user. If you wish to put shield of discord (mythic) on Elena and boost her Guardian Angel ability then do so. Usually players put the strongest artifact they have depending on its quality and burnish + Glory Stones on the strongest angel they have to boost his GA ability and get the hero the angel is Guarding the best stat boost. - They are already created please check the links above. :) If you re-check our General guide posted by whatif you can see various links of threads, those are guide links which will re-direct you to the guides you need. - For now exchange for extra shards will be put into smelting event only. 9.) Need angels artifact diagram, like the one we have in game for totems where it shows all totems and all evolves and effect. - If you go to Party-> Angel Artifact-> and click on "Artifact Guide" at the down right corner you´ll see what you asked for. 10.) I have over 10k group tickets, how can I get rid of extra stuff that you cannot sell? - At Group Buy when the price for example: Gem cards is over 70% off or 50% you gain discount and its price is so low you can afford buying them only with Group Buy tickets. 11.) A: -Which Glory Stone is more useful for heroes and main char! B:-Which Dragon soul is more useful for heroes and main Char! Answer on A: You can use your Glory Stones depending on the build, but if you focus on your Glory Stones as this: Silvan, Aeolus, Earthen, Flaming, Shadow, Brooky you won´t damage your build, however each player has his/her own opinion on this. Answer on B: This is again dependable on your own build. If you focus on dodge then dodge dragon souls, if for endurance then END, if for speed build then agility build, this may be different for everyone as your builds are different and it is hard to say. 12.) Guide about how to level fast main character for example if today level 75 tomorrow can reach level 76 and tomorrow again can reach level 77. - You can purchase Stamina directly. Directly means when you see your Stamina there is small "+" click on it and notification will show up asking if you want to purchase STA. Another way is to buy Value Pack from shop, from HoC or other events. Skip Loops this will give you STA your loops will be finished for 100 dias and your hot events for finishing 50 loops completed. Save Feast chests from guild feasts. Etc. 1.) How do you actually get anything useful from the Khaos Atlas? I see no results from anything I do in that book? Khaos Atlas is secondary system which needs Khaos core which you can gain from primary system Final Stand War. Here you gain points and then you purchase cores. After you have enough of cores you draw cards at Khaos Atlas, after you have cards you can equip them to your heroes or even to your main chracter and boost your power! 2.) How to use glorystones I accdntally craft it, but how does it work? Im 64 so when the function is open? - We apologize the fault of the description on glorystones was fixed. Previously it said can be used at lvl 54, but after correction they can be used after you are lvl 70. At lvl 70 Artifact Workshop (system) opens to you and you can socket them. As for now you can collect them from events and save them for later! 3.) I would like a useful guide for NON-CASHERS! Please tell us which guide exactly and we will try our best to provide you the information you seek. If you couldn't find answer to question you seek do not hesitate and ask your Question at this thread! If we´ll find it as needed we´ll add it into our General FAQ Guide.